It is said that a photo is worth a thousand words. If that is so, then this photo is worth countless thousands. Look at it. Cut and move it to where you can blow it up to full size and fill the screen. Study it. Note the refugees who await setting foot on land on the left side. See the urgent attention in the faces of the rescuers who are handing off and receiving the young child. Look at the faces of those on the right who have disembarked and are headed off to a new life. That gripping photograph was featured in an impressive two-page spread in a recent issue of Christianity Today. To further emphasize the emotions and compassion, the editors let the photo bleed off all four sides of the pages—a more expensive process that allowed the picture to exert an increased impact on the reader. At first I thought it was a painting, an interpretation of an incident. But it is a real photo of an actual event that really occurred. And, it is only a microcosm of what is happening to millions of people around the world, not only those fleeing from ISIS in the Middle East but others who flee regularly from the terrible violence and unemployment of Central America, the persecution of minority groups in Myanmar, terrorist violence spreading through Africa—and the list goes on and on. 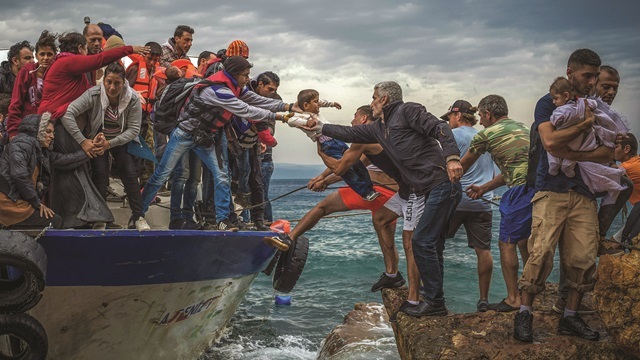 And, each of those who are pictured–the woman waiting to get off the boat, the child being handed off, the father carrying his little child on land—each of those are individual stories. Stories of pain, grief, suffering, anger, hatred, hope, success, failure. Take the Cambodian man I called one Saturday back in 1981. I was the executive director of a multi-denomination agency in Louisville that was resettling refugees from many parts of the world, but particularly from southeast Asia in the wake of the war in that region. From that same era, I remember a Vietnamese man who had searched refugee camps to find his mother and siblings. When we were finally able to bring them to Louisville, he immediately jumped in and made a home for them with the help of a local church, getting them used to living in their new location. We lost regular touch after a while, but until we left the Louisville area over a decade later, he showed up at our house every Christmas season to bring us a present and catch us up on how they were doing. Perhaps a study of this photo will prick our conscience about the current wave of refugees. Not that we can take unmanageable numbers, or shouldn’t take all the precautions necessary to protect our security. But perhaps we should be, ought to be, must be finding ways to help them escape the ravages of war and the trauma of fleeing from family, community, violence and death. We can use millions of words to argue the issue. But, hopefully, one picture can make us more concerned and willing to help. Oh, one more thing. Remember, Jesus and his family were refugees once in Egypt. I wonder how they were received. Sidebar: Numerous agencies in the U.S. help settle refugees through churches or with individual families or communities. If you or your church are called to help, you might want to check out Church World Service, World Relief or Catholic Charities. With Mr. Obama off to Cuba for the first presidential visit in over 80 years, there is much to be hoped for in the new rapprochement between that nation and the United States. However, according to a recent article in Britain’s Guardian Weekly newspaper, there are some sobering side issues that aren’t what you expected and are seriously concerning. The new openness between the two countries will change Cuba for sure according to the newspaper. While there are those who hope that those changes will be for the improvement of the Cuban people, some of them reflect ominous trends. The most staggering change is, of course, the arrival of the Americans,” (the Guardian said,)…reverting Cuba to a 21st-century variation of its old role: the naughty weekend in the sun, music and sleaze – the exploitative playground that enraged Fidel Castro, his brother and Che Guevara sufficiently to overthrow it…. Havana is by far the safest Latin American capital; drug consumption is minuscule and organized crime of the kind known to Mexico City, Bogotá or San Salvador is nonexistent. But no multinational corporation will be as anxious to invest in the newly open Cuban market than the Mexican narco-cartel Los Zetas, which controls the Caribbean…and whose product can cater in its pure and expensive form to Cuba’s partying visitors, and as basic bazuco, crack, for the local poor…. (Esther) Cardosa is among Cuba’s great creative figures, an actress and director of drama whose story has been central to the renaissance of independent, innovative and surreally creative Cuban drama during the 80s and 90s…. But while Havana prepares for construction and renovation on a massive scale, the beautiful three-tier stage space at her theatre Casa Gaia – on what she thinks could become Havana’s “cultural corridor” – with performance areas both covered and al fresco, is like many of Havana’s lovelier buildings, falling down. Wait a minute. The staggering changes to Cuba and its beleaguered society will be a massive investment of narco-money to prey on the addictions of Cuba’s “partying visitors” and an influx of business people who want to transform a proposed, high-quality performance center into a “VIP hotel for prostitution”? One could become very discouraged by these reports and the pervading sense of evil and deep sin in those who would further destroy a country that has suffered through hardship, hunger, poverty and dictatorship for fifty-five years. That hope is the church, both Roman Catholic and Protestant, but particularly the Evangelical or Protestant churches that exist and are a growing, dynamic force in the country. The same Guardian newspaper reported last year that The island has experienced a religious revival of sorts in the past 25 years…. (t)he Catholic church and other denominations have come a long way from the 1960s and 70s, when Fidel Castro’s revolution sent religious believers to labor camps and enshrined atheism in the constitution. Guevara’s group is affiliated with Victory Outreach International, a Pentecostal order founded on the streets of Los Angeles that is known for evangelizing among addicts, inmates and the homeless. In Cuba, the group has no church, but Cuban authorities allow them to congregate Sunday mornings for worship along Havana’s Malecón seawall. They bring their own generator to power the microphone and the speakers, attracting hundreds. “The presence of Christ is strong where sin is abundant,” said Daniel Delis, wearing long dreadlocks, after a small church weeknight service in a fellow member’s home. He said his faith helped him overcome an addiction to marijuana. The Pentecostal group says it goes out on weekend nights to walk among the revellers along Havana’s seawall…occasionally facing police harassment. In 2011, CNN reported, (A)s the country confronts hard times, followers have come out of the shadows, turning to religion to meet both economic and spiritual needs…”. The Rev. Marcial Miguel Hernandez is the pastor of a Pentecostal church and the president of Cuba’s National Council of Churches. Rita Suarez, a television worker who frequents Hernandez’s Free Evangelical Church, said many people were seeking spiritual guidance. “When we have faith, we find the strength to make things work in this new scenario,” she said. Since the 1980s, the number of evangelicals in Cuba has more than tripled to one million, according to the National Council of Churches. Polly and I saw that excitement, growth and enthusiasm when we led a several-day workshop at a church in Havana almost a decade ago. Some participants walked at least two hours one way each day to attend the event. And, they talked with passion about the church there. Others donated their entire monthly ration of chicken or fish so the group could eat. They told us of the exploding expansion of churches which were crowded into buildings that needed to be expanded. However, government regulations prohibited any church construction or addition. So, congregations, such as the one where we held our meetings, adapted by adding a covered roof-top terrace to provide space and protect from the intense sun. I will never forget one participant, a retired university professor, who told me privately that his group was looking forward to the day when they could own their own facility and expand their work. I reminded him that that under current law they couldn’t do that. While outside churches and mission groups should and will play an increasing role in supporting the growing Evangelical population in Cuba, it will be Cuban Christians themselves who must and, I believe, will become the force that helps their nation to resist the outside influences from groups such as the narco-traficantes and unscrupulous business people who would convert a potential cultural center into a place of sin and evil. We and Cubans must urgently pray together that the Lord will be made known during these exciting and demanding times.